• Natasha Ali Wilson - Sonya Twenty-two year old Natasha is a professional performer. She has guest starred in many projects including Huff, an HBO Drama with Oliver Platt and Hank Azaria, and played a lead role in Return to Cabin by the Lake, a feature film with Judd Nelson. She has also been writing and recording vocals with local artists. Natasha moved around a lot as a child: New York, Montreal, Toronto and eventually Vancouver. Instability and violence in her home life meant she was placed in care, through the Ministry of Social Services. She feels that moving from one group home to another inside the system simply added to her childhood sense of instability. These early life experiences make it important to Natasha to be a part of Here and Now, a project in which she can use the insights she gained, along with her passion for the arts, to bring awareness to silenced truths shared by many in her community. • Shawn Cheema – Jay Shawn is a 19 year-old who has experienced the drug trade firsthand. By participating in Here and Now, Jas is following her urge to become actively involved in helping other parents who are facing the same ordeals, to prevent more teens from becoming entrenched in destructive behaviour or losing their lives. Jas hopes the play will empower parents within the South Asian community, to show them they are not isolated, and encourage them to admit what is really taking place in their own homes. • Balinder Johal– Partap Kaur (Daadi) Born, raised and educated in India, Balinder came to Canada in 1965 and taught in the BC school system and at the Vancouver Community College for 24 years. She has worked in theatre, educational videos, TV and film in English, Punjabi and Hindi. Her Chachi ji episodes on community-related issues have been an attempt to bridge cultural, educational, gender and generational gaps. Why is she doing Here and Now? • Jagdeep Singh Mangat– Kam Jagdeep is a local community activist, social justice organizer and writer. Drawing upon insights gained through his own experiences on the streets, over the past several years Jagdeep has shifted his community service work toward addressing issues of alienation and violence amongst youth today. He is currently focusing his efforts on combating youth violence within the South Asian Diaspora, bringing contextual understanding to the issues, and empowering youth through promoting critical and active social engagement. Most recently, Jagdeep has worked as a Community Support Worker with the Downtown Eastside Residents Association (DERA) and is set to start working as a Support Facilitator with the Surrey Urban Youth Project. He is expecting to complete a BA in Sociology at Simon Fraser University by December and spends his spare time studying political-economy and engaged in anti-war and anti-racism campaigns. • Seth Ranaweera – Sunny Seth is intrigued by the exploration of violence in the community because of his own early experiences with violence. He hopes that this project is able to bring about a significant and positive dialogue between 1st generation immigrant parents and their 2nd generation children. We must, he says, find a way to break the cycles. Seth has toured all over North America performing Shakespeare. His TV credits include Dark Angel, The Dead Zone, Human Cargo, and was the voice of “Ishvar the Tailor” from CBC Radio’s production of A Fine Balance. He is currently a part of CityTV’s Emerging Writers Intiative, and is finishing his pilot Grand Opening for them. • Raminder Thind – Jeewan (Dad) Born and raised in the District of Patiala, Punjab, India, Raminder is a triple post graduate in Theatre, Journalism, and Public Relations & Advertising from Punjabi University Patiala. In India, he is a well-known as a theatre professional who has strived throughout his life to highlight community problems through theatre. Raminder has been involved in social justice work from a young age. Since coming to Canada a year ago he has seen that these issues exist in his local community. The issues being connected to his life and his desire for change lead him to Headlines Theatre, and Here and Now. • Manjot Bains – Publicity and Outreach Assistant Manjot comes from a background in public relations and communications. She is a graduate of SFU’s Communication program, where she created a short documentary on the identity and culture of second-generation Canadians of South Asian descent. Manjot’s interests lie in researching the experiences of South Asian youth in Canada and raising awareness of the issues faced by this community. She is a big fan of Bollywood movies, bhangra music, and chocolate. In her free time, she is a freelance writer and painter, and moonlights as a Communications Coordinator for the Vancouver International Bhangra Celebration (VIBC) Society. • Kashmir Besla – Community Scribe Kashmir is the proud mother of a fourteen year old son. She has worked as a family counselor as well as with victims of violence for over twelve years. Kashmir is currently in the process of writing her thesis to complete her Masters in Counselling Psychology. She enjoys working with youth and families, as well as taking part in community activities. Kashmir is looking forward to working with Headlines as the community scribe. • Dafne Blanco – Community Outreach Coordinator Dafne has been involved with several grassroots organizations and art groups since she arrived from Mexico more than nine years ago. Some of these groups include Latin American Connexions, an analysis community newspaper, and Building Bridges, a human rights observer’s training organization. Using her visual arts background, Dafne has put together several multimedia presentations to promote popular education on the areas of First Nations struggles, Racism, Globalization and other social issues. • Jen Cressey – Publicist Jen has been an active creator, producer, and publicist of grass-roots cultural events for more than 10 years. She is best known as producer of cabarets that have been staged at the Wise Hall, the Waldorf Hotel, Heritage Hall, and the Anza Club. For the past year, Jen has been training in a circus discipline called aerial silk, and is thrilled to be performing daredevil dances for local audiences. • Jackie Crossland – Financial Administrator Jackie Crossland has many years experience in Vancouver’s arts community both as an administrator and as a theatre artist. She combines her administrative and artistic skills to make a unique contribution to the organizations that she has been associated with over the years. In addition, she has been to clown school so your company is safe with her. • David Diamond – Director/ Joker Since 1981 David has directed over 350 community specific theatre projects on issues such as racism, gender roles, violence, addiction, self-esteem, First Nations’ Residential Schools, globalization, language reclamation and many, many others. David has directed workshops throughout BC, Canada and the USA, as well as in Namibia, New Zealand, Germany, Austria, Italy, Singapore and Finland. He has also been involved in the writing and/or directing of all of Headlines’ main stage plays, including NO’ XYA’ (Our Footprints), Out of the Silence, Mamu, Squeegee, Corporate U, THIR$TY, Don’t Say a Word and the Legislative Theatre project, Practicing Democracy. David has pioneered the development of live, interactive Forum Television and web casting. Diamond is a 1975 graduate of the University of Alberta with a BFA in acting. He worked as a professional actor in theatre, television and film throughout Western Canada until 1981 when he co-founded Headlines Theatre. He is the originator of Headlines’ THEATRE FOR LIVING workshops, based on Brasilian Director Augusto Boal’s ground-breaking Theatre of the Oppressed. • Craig Hall – Technical Director Craig is a Director, Set Designer, Technical Director, Stage Manager, Dramaturge who’s looking to diversify into playwriting, lighting and possibly acting (God help you all). Recent directing credits: Broiler for Theatre Replacement and Lazy Susan for Theatre Melee. Recent design credits: San Diego for Rumble productions and Chasing the Money for Greenthumb Theatre. Craig is a graduate of Studio 58. • Kitty Hoffman – Stage Manager Kitty has worked behind the scenes in theatre and live entertainment for 7 years in various capacities. She first worked with Headlines on Practicing Democracy last year as head electrician, and is honoured to also be a part of Here and Now. Topics explored in this play should exercise everyone’s ability to relate and lend ideas to truly universal struggles such as alienation, power and the path that both can lead to for some. Stage Managing this show meant that she could be a part of both the workshop and entire creative process from beginning to end, what an amazing journey. • Julie Martens – Set, Props, Costume Designer Julie is very excited to be working with the folks at Headlines Theatre. Most recently she has designed for Leaky Heaven Circus (Bonobo), Laluna Theatre (Faith), Theatre la Seizieme (Les Contes Vancouverios), and with Theatrelacatapulte (Cette fille-la/ The Shape of a Girl), in Ottawa). In years past she was awarded with a Jesse for her set/light/costume design for Mathieu Mathematique (Seizieme), other nominations have included Mentuers (Seizieme) and Cette fille-la (Seizieme/Catapulte). She has also spent time in the past as the Production Manager for The Public Dreams Society (3yrs), and as the Production Manager for The In the Heart of the City Festival (Vancouver Moving Theatre/Carnegie Centre). A graduate of the BFA Design Program at UBC, Julie has spent some time at the Banff Center learning more about aspects of technical lighting. She’s very happy to have been given the chance to work on this very meaningful and relevant project. Thanks to the cast and production team for their very committed work. • Dylan Mazur – Production Manager Dylan has been the Production Manager on three of Headlines’ main stage projects: Don’t Say a Word, Practicing Democracy, and Gimme the Keys. Outside of Headlines, Dylan serves as BC/Yukon Regional Chair with Oxfam Canada. He served two terms on the Board of Directors of the Vancouver Association for the Survivors of Torture (V.A.S.T.). • Sudnya Naik – Movement Coach Sudnya is a professional Bharata Natyam dancer, choreographer and teacher. She has performed widely in India and Canada. Her performances in festivals include Vancouver and Yukon Story Telling, Vancouver International Children, Jazz Festival, Sacred Music Festival, Vancouver Folk Festival and many more. Her choreographies and performances on episodes of Ramayamna epic The Golden Deer and Seeta Tyaga (abandonment) were greatly appreciated by the scholars of Ramayana. To share her knowledge of Hindu culture, she performs in schools and gives workshops through Art Starts In Schools. 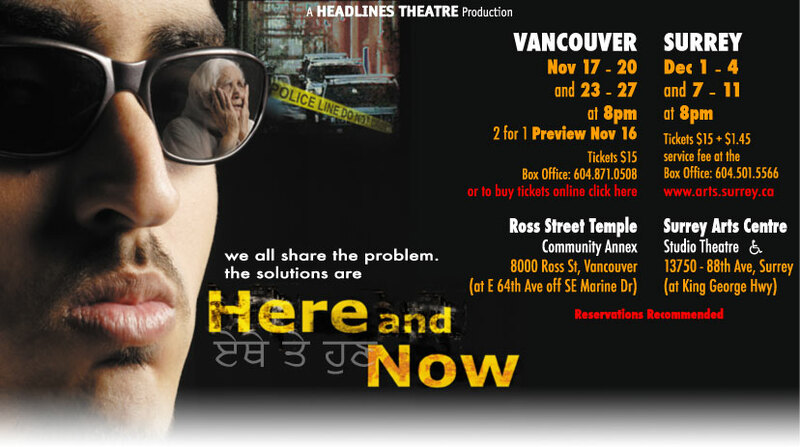 She has worked as an Artistic Director for Vancouver Celebrates Diwali. Sudnya completed her BFA in Bharata Natyam and MFA in Choreography from the University of Mumbai, India. • Caitlin Pencarrick - Lighting Designer This is Caitlin’s second show with Headlines Theatre, having designed lights and co-designed video for Practicing Democracy in 2004. Currently an administrator at Judith Marcuse Projects, Caitlin has worked as a Lighting Designer, Technical Director, Production Manager and Equity Stage Manager. She has toured nationally and internationally with a myriad of local organizations, in dance and theatre. She is thrilled to be working for positive change through the arts, thanks very much to Headlines for the opportunity and Amos and Cheese for the support.